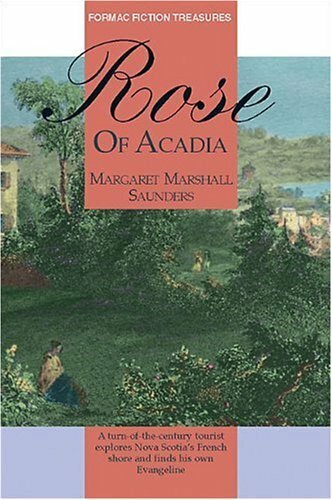 Rose of Acadia, by Margaret Marshall Saunders, is a historical romance. It’s not set in the past – it’s set in the present – but it was first published in 1898, as Rose à Charlitte. Out of print for many years, it was reprinted in 2002. To fully appreciate this book, some historical and literary context is necessary. The Acadians were French settlers in parts of Nova Scotia and New Brunswick, who arrived during the 1600s. They settled in the Annapolis valley region of Nova Scotia. In 1713, with the end of the War of Spanish Succession, they became British subjects, but continued their distinct culture, including speaking French and attending Catholic church. In 1754, the British government demanded Acadians take an oath of allegiance that included fighting the French. Most refused, and starting in 1755 they were deported and their communities destroyed. Over a three-year period, between 10,000 and 18,000 Acadians were sent to the American colonies or to France. Families were separated, and thousands died or were killed. The deportation ended in 1763, when France signed the Treaty of Paris. Gradually many Acadians returned. In 1847, Henry Wadsworth Longfellow wrote his famous epic poem Evangeline. Evangeline and Gabriel are fictional young Acadian lovers, separated during the deportation. She wanders the American colonies trying to find him, finally discovering him when she’s a nurse in a hospital. He dies in her arms. The poem popularized Acadian history, and drew attention to the 150 years of Acadian settlement in Nova Scotia prior to the British founding of Halifax. However, it also downplayed the role of the (then British) New Englanders in the deportation, and portrayed the Acadians as uniformly peaceful, pastoral, and passive. The popularity of the poem helped encourage Acadians and others to maintain Acadian culture. 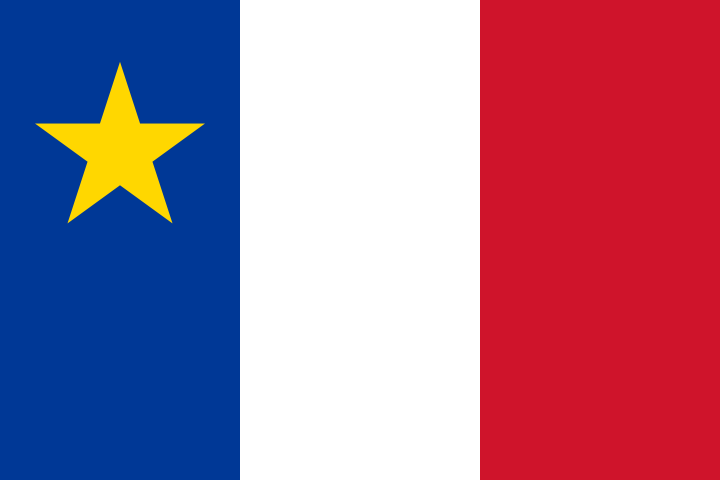 In 1864 Acadians founded a college, and by 1890 they had established a holiday, a flag, an anthem, and a second college. However, some marketers, particularly the Dominion and Atlantic Railway, used the pastoral image of Acadians in the poem to promote the area to tourists as a nostalgic backwater. Evangeline, a symbol of purity and goodness in the poem, was commercialized as a trade name for a range of products and services. The drive from Halifax to Yarmouth via the Annapolis Valley is still known as the Evangeline Trail, and gift shops along the way have Evangeline themed souvenirs. Saunders was a progressive writer who advocated for causes such as animal rights, children’s rights, and votes for women. Her first book, Beautiful Joe (1893), was an animal rights story about a dog, deliberately written along the same lines as Black Beauty (1877), for a contest run by the ASPCA. It was the first million copy best seller in Canada. Which brings us to Rose of Acadia. Vesper is a young Boston businessman, recovering from an illness. His father died young, his grandfather died in a ship fire, and his great-grandfather committed suicide. Vesper discovers his great-grandfather was not only involved in deporting the Acadians, but killed a man who protested their treatment. Vesper resolves to travel to Nova Scotia, find the descendants of the man his great-grandfather killed, and try to make amends. Vesper stays at a small inn, run by Rose, a widow with a young son. Vesper is a little surprised to learn the kitchen has all modern conveniences, and Rose has been to Boston. She traveled there to sample hotel meals, before starting her business. Vesper also meets Rose’s cousin Agapit, an aggressive defender of Rose and Acadian culture. Rose and Agapit are both suspicious of Vesper, as they suspect he is a journalist, and are weary of people coming to write about their quaint society. Vesper has a relapse, and Rose closes the inn to care for him. His mother compensates Rose for the lost business, and Rose learns Vesper is both relatively wealthy and not a journalist. Eventually he recovers, and finds Bidiane, the only descendant of the man his great-grandfather killed. Bidiane is a feisty red-haired orphan, in the care of relatives, a colourful lower class couple who have rejected their french name and origins. Vesper also becomes fond of Rose’s son, and Rose, and the attraction is mutual. Unfortunately, Rose cannot marry Vesper. Her husband is still alive, and living with another woman in New Orléans. A good Catholic, she tells Vesper that she cannot divorce, and they can never be together. He returns to Boston. The son stows away, follows him to Boston, and Rose and Vesper agree that is best for the boy to live with Vesper. Vesper also arranges for Bidiane to be educated in Paris. Five years pass, and Bidiane returns to the village, now a refined and very modern lady. She bicycles around, carelessly showing her ankles, and declares to the love-lorn Agapit that she does not wish to marry. “Just fancy having to ask a man every time you wanted a little money, – and having to be meek and patient all the time. No, indeed, I wish to have my own way.” However, she admits having just a little respect for him. Bidiane also takes an active role in a provincial election, arranging for Agapit to be a candidate, and helping buy votes with servings of rum, and cash discreetly left on mantels. He wins a seat, and invites her to travel to Halifax with him, but she is reluctant. Apart from her hesitation to marry, the overland trip to Halifax is much less convenient than the rail and steamer trip to Boston, thanks to the geography of Nova Scotia. By now Rose has sold the inn, and lives quietly in a small house, decorated in the latest style with furniture she bought on trips to the United States. One day a strange sail appears in the bay, and everyone is surprised to see the return of Rose’s husband. Saunders’ characters recognize the parallels between Rose and Evangeline of the poem. But Rose lives in a modern and progressive society, not a nostalgic backwater. The people are not homogeneous, but have different understandings and appreciations of their history. The younger Bidiane demonstrates that the most radical ideas of women’s liberation are reaching Acadian villages in the late 1800s. Saunders also corrects the poem’s portrayals of the Acadians as passive, and the New Englanders as innocent. Finally, Saunders gives her main characters happy ever after endings, once the women are satisfied with the arrangements. Instead of indulging in a simple romantic past, as Evangeline does, Rose of Acadia acknowledges the complexities of the past, present, and future. The novel is slow-paced, and the contemporary descriptions of courtship and even daily life are sometimes hard to follow. As a minor example, people refer to bicycles as “wheels,” as in, “I have a wheel.” There are moments of humour, such as Saunders referencing herself in the novel, but these are easy to miss. There are some too convenient coincidences, and the handling of black and native characters, while not blatantly offensive, has overtones of the racism of the time. A few secondary characters are almost caricatures, and speak with heavy dialects, but this was popular in fiction at the time, as was the feisty red-haired orphan girl. Orphans girls were a subset of the popular orphan in Victorian fiction. The most famous example is Anne of Green Gables, published in 1908, ten years after Bidiane was introduced to the world. Despite its flaws, this is a very good romance novel. In modern terms, it would be a Christian historical. It’s also a fascinating glimpse into the past of rural Nova Scotia and Acadian culture.